What’s The Best Dog Bed For Your Pooch? Your dog might love sneaking up onto the sofa or snoozing on the end of your bed at any given opportunity, but it's still important that they have their own bed too. A space which is just theirs, where they can go to to feel safe and secure. There are loads of different dog beds on the market, each suiting different types of dog breeds, personalities and ages so you'll need to do your research if you're looking to invest. Here are just a few you could consider. These are pretty much a large cushion or pillow, they're useful as you can get them in all types of colours and materials so it will blend in with the rest of your decor. They normally contain foam padding or polyester filling which is cosy and comfy for your pooch to lie on. Some are made to prevent bad odours, and because you can unzip the cover and wash it in the washing machine it's easy to keep it clean and hygienic too. Nest beds are usually made of plastic, which you add your own blankets or cushion too. These are the beds I've gone for with my own dogs, I like that they can be easily wiped down and the blankets can be chucked in the washing machine regularly to keep everything clean and fresh. The only issue I have is because one of my dogs is so big, his bed is absolutely massive. As it's plastic it cant be folded down like some of the others so does take up a lot of space. If you have smaller dogs I'd definitely recommend getting one big bed for them to share, I wish I could have done this with mine but we already have the biggest size available and there's definitely not room for them both in there! A donut bed dips down lower in the middle with raised edges, and is a really soft and cosy option for dogs that like to snuggle up. Old or weaker dogs may struggle with getting in and out of these beds because they are so plush, so have a think before investing if this style would suit their needs. Orthopedic beds are made especially for dogs that suffer from arthritis or any other orthopedic problems. Made with super high quality, thick foam, these beds give your dogs the support they need, and take off the pressure of their weight, putting less stress on their joints. These are great for any dogs but mostly benefit old, weak or thin dogs as they prevent pressure sores and calluses. For a luxurious dog bed option you could go with a raised bed. They're usually made of wood, metal or plastic and can be custom made to look however you want. 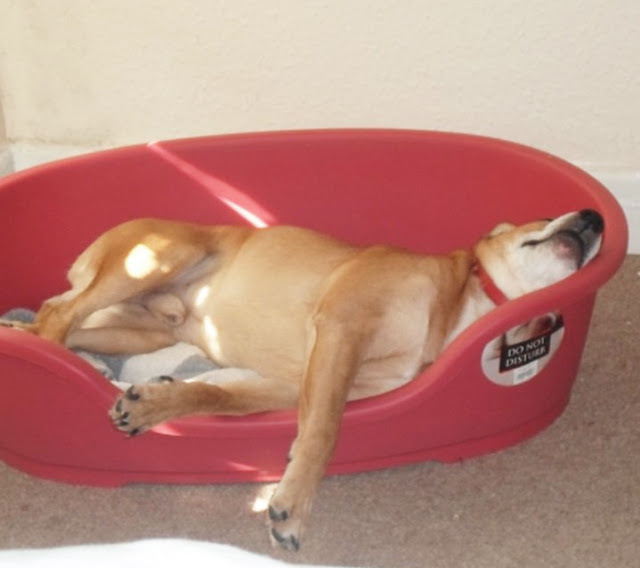 You can even have personalised dog beds made to look exactly like your own bed! This would be a cute addition to the decor, as opposed to detracting from it like many dogs beds can do. Raised beds may not be appropriate for dogs with orthopedic problems or breeds prone to back problems though, as jumping to and from the bed could cause harm or discomfort. But for many it's a cute, practical option. Dogs are naturally den animals, and feel safe and secure when in this kind of environment. If you've noticed your dog likes sitting under tables, desks, beds or anything else- this is the reason why. This is what makes hooded dog beds great as they feel a sense of security in them. Unfortunately you can only usually find them for smaller breeds, which is a shame because I know my older dog would love something like this. Travel beds can be rolled up or folded into a convenient size to travel with. If you're staying away from home or even going on holiday with your pooch then a travel bed is essential to keep them warm and comfortable.